True to its name, the sterling silver Cupid promise ring is distinguished by two joined hearts. The ring has two 3.5mm round genuine birthstones. Engrave up to 10 characters in each of two engraving areas. Import. I purchased this ring for my mother for Mother's Day. It is a beautiful ring and very unique. 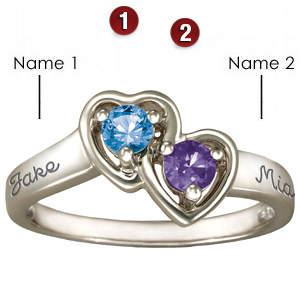 I love that mine and my brother's names are right on the ring. I know she will get very emotional and will LOVE it. The only thing that makes me nervous is the sizing, which cannot be changed as it is a special order ring. I had to guess on her size (I tried on her ring to get an idea). I ordered a mothers ring for my daughter, they did a wondefful job on it.....I would order from this company again. What can I say? I'm really impressed by its design and the customer service i received from this site. Not to mention the prompt arrival of the ring. I'm planning on giving it to my girlfriend as a gift and I think that she'll be sincerely please.